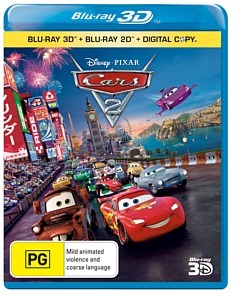 Cars 2 Blu-ray Review So, the final verdict is this: watch Cars 2 if you are still trying to get rid of that blasted aftertaste of Fast and Furious 5. One of the many strong points of Cars 2 is that you don't have to watch the first instalment to understand and enjoy this sequel. In fact, this film embodies a 'spirit' almost entirely different to the first. Part spy-movie, part bromantic comedy and part action, it is a welcome new addition to the Disney/Pixar oeuvre. Don't be surprised if this gets nominated for Best Animated Feature for the next Academy Awards. The ambitious Lightning McQueen (Owen Wilson) has returned to Radiator Springs for some quiet catch-up time with flame Sally (Bonnie Hunt) after an exhausting racing tour. However, he is soon off on a trans-continental, biofuel-based World Grand Prix to prove his racetrack finesse against Italian rival Francesco Bernoulli (John Turturo). 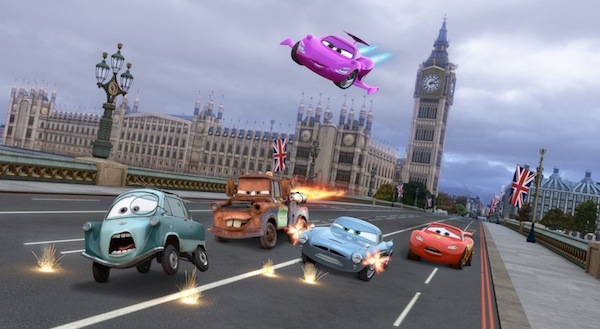 Meanwhile, British Intelligence, comprising of Finn McMissile (Michael Caine) and Holley Shiftwell (Emily Mortimer), mistakenly include McQueen's best friend Tow Mater (Larry the Cable Guy) into their spy circle, with hilarious consequences. For newcomers to the franchise, the world of Cars is very cleverly designed. It is mainly inhabited by anthropomorphic modes of transport – talking automobiles, aeroplanes, ships. The depth with which the film operates will make you wonder many unnecessary but interesting things: So, how are these cars manufactured with no humans around? Do they worship some kind of car-creating deity? Where do baby cars come from? And how do cars even reproduce? Overall, the main highlight of the film would have to be Larry the Cable Guy as Mater, the epitome of social naiveté. Among his many faux pas are mistaking wasabi for pistachio sauce and perceiving the art of Japanese sand-raking to be a workplace chore. Luckily, his encyclopaedic knowledge of all-things-cars allows him to be the heroic undercover agent of the day, exposing the deceitfulness and corruption of a certain well-trusted character. Visually, the background settings throughout the film are stunning: the neon jungle of Tokyo, the seediness and elegance of Paris, the familiarity of London and the opulence of the fictional town of Porto Corsa – the gem of the Italian Riviera. All of these are excellent suggestions for future summer holidays. If only Porto Corsa were real and with the inclusion of 3D on Blu-ray... wow. Being a PG-rated film, older audience members need not worry about boredom. Many will be excited to see Marxist themes enacted by computer-animated characters, as loser 'lemons' aim to overthrow the cool racing cars that the world hypnotically loves. Also, the oldest action fan will drool over McMissile's extensive body of weapons and tricks: guns, bombs, submarine propellers, Mystique-like disguises. I wonder what Inspector Gadget would think. Marxist revolutions, the efficacy of biofuels, U.S. - British misunderstandings and the banes of social inexperience – Cars 2 entertainingly tackles these big ideas in less than two hours, in the form of a simple kids' pic. Disney and Pixar have pulled off a mammoth task indeed, and with speeding chrome colours. So, the final verdict is this: watch Cars 2 if you are still trying to get rid of that blasted aftertaste of Fast and Furious 5. For special features, the six-minute Toy Story: Hawaiian Vacation is shown but is dwarfed by the giant. Add in commentary and Air Mater and this rounds up a wonderful Blu-ray release that is a must have for owners of 3D televisions.